A bit of a preamble, if I may. 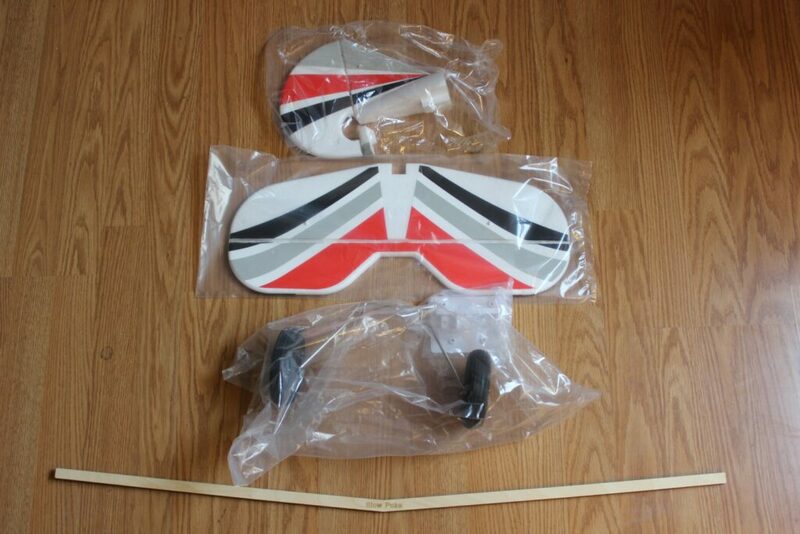 I’ve reviewed a number of HobbyKing products over the years and I still have all of them. Making the experience better were the contacts I’ve had the pleasure of knowing. One of those contacts was a gentleman named Toby Osmond. It was here on RC Universe that I learned of Toby’s promotion to CEO! The article by Geoff Barber can be found here. The email address I had for Toby was still good and he answered my congratulatory message right away. To paraphrase him, he said that bashing HK on hobby websites had become a hobby for many and one of his many goals was to change that. Given my past history with HobbyKing, I was determined to help him. If free shipping options and goals of improved customer service weren’t enough, the upgraded products really added icing to the cake. This brings me to the subject of our review. 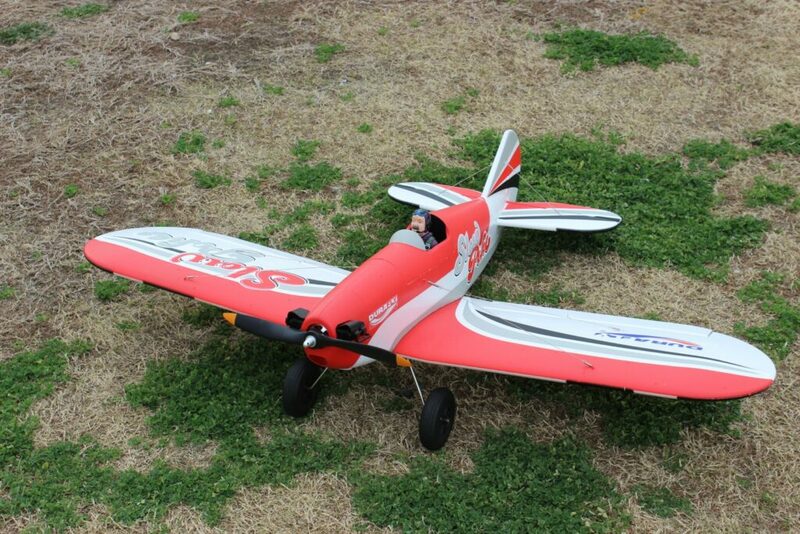 I’ll be talking about the Durafly SlowPoke 1200mm plug-n-fly. 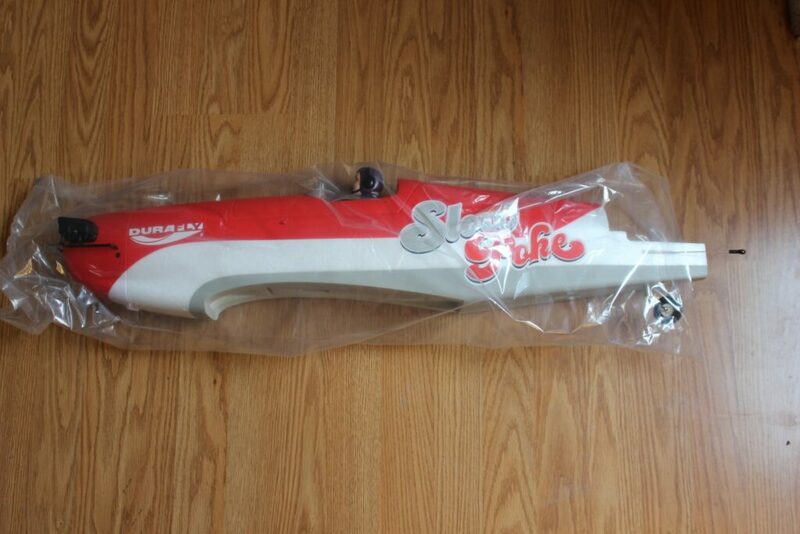 Yes, it’s true this model has been out for awhile…but not in red! It’s so new that as of this writing, it showed up online just before this review was published. It was Toby’s idea to have me talk about this model and in doing so, he placed me in contact with Rebecca Bestawros in the HK marketing department in Australia. This delightful lady quickly arranged to send a pair of Turnigy high discharge batteries and a FrSky receiver for my existing radio via the Oregon warehouse. However, the batteries may be new and unreleased. 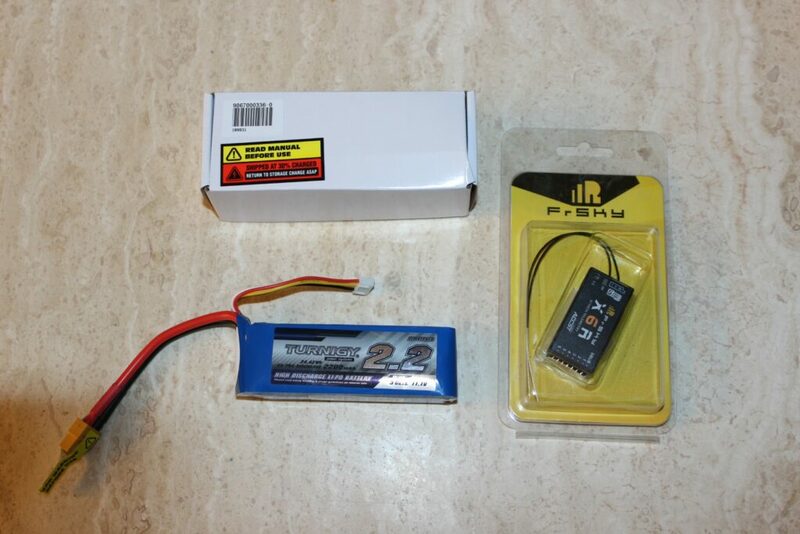 The only Turnigy 2200mAh 35-70C batteries listed are the Nano-Tech versions while these batteries are labeled as good old Turnigy. 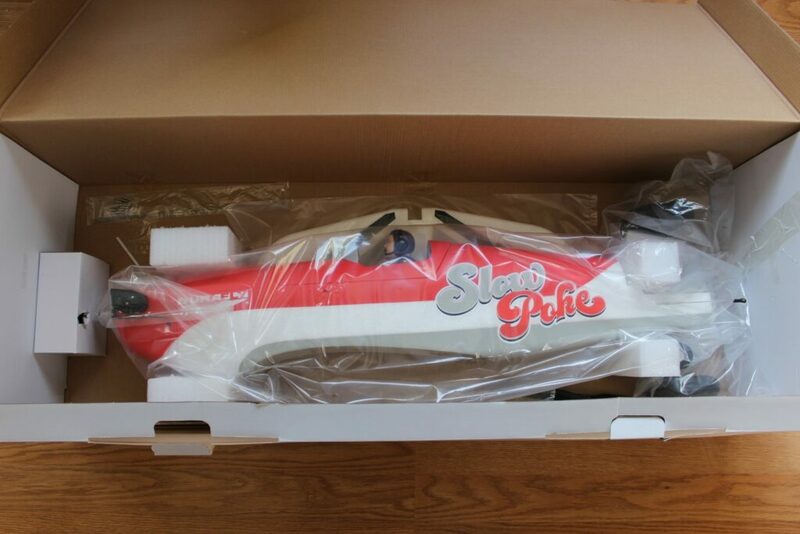 A few days later, the model arrived just in time from Oregon for an RC Universe scoop! Let’s take a look at the many reasons this model has become as popular as it has. One needn’t worry about possible shipping damage. 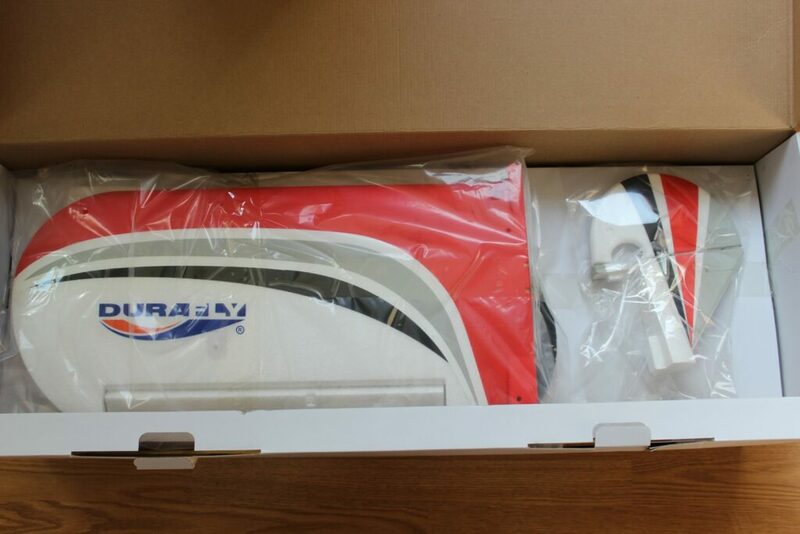 HobbyKing has always done a stellar job of shipping their models in sturdy shipping cartons. 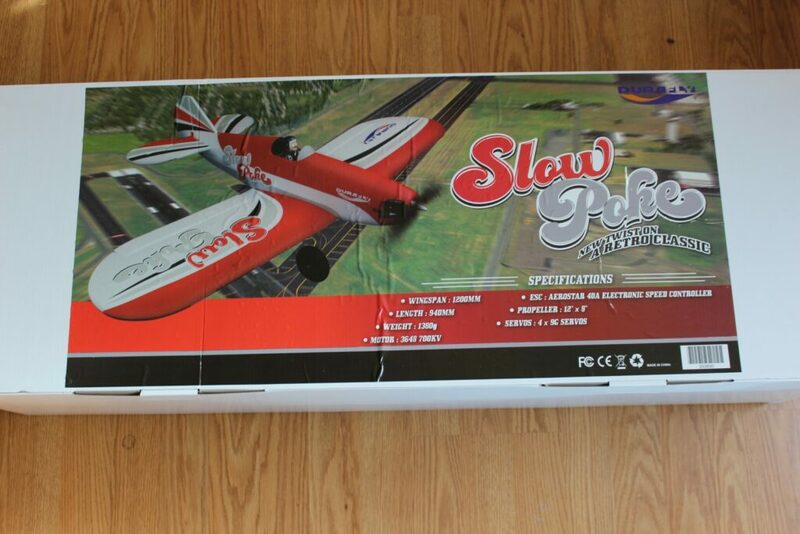 Inside was a plain white display box with beautifully rendered artwork of a red SlowPoke in flight. I’ve often said that HobbyKing’s goal may well be brick-and-mortar stores since the artwork is always so well done. The parts of the model were all carefully bagged and taped; the fuselage had the distinction of its own foam support blocks glued to the floor of the box. Everything looked perfect right down to a beautifully painted pilot bust and simulated Continental cylinder heads a la Piper Cub. Fit and finish were on par with the best EPO offerings out there with the extra added attraction of ball link hardware! No clip-on clevises here. 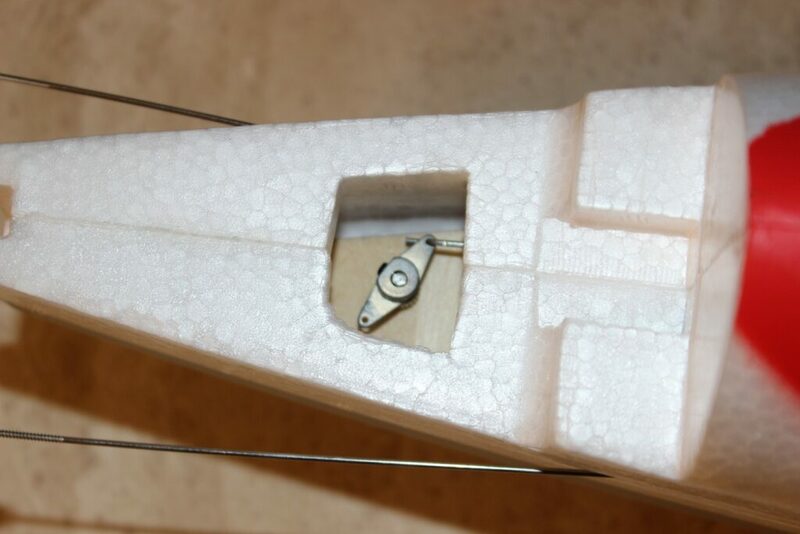 The aileron, rudder and elevator pushrods all terminate with a nylon and brass ball link. I’ve seen this on pricier models than the SlowPoke and they’re a welcome sight here. 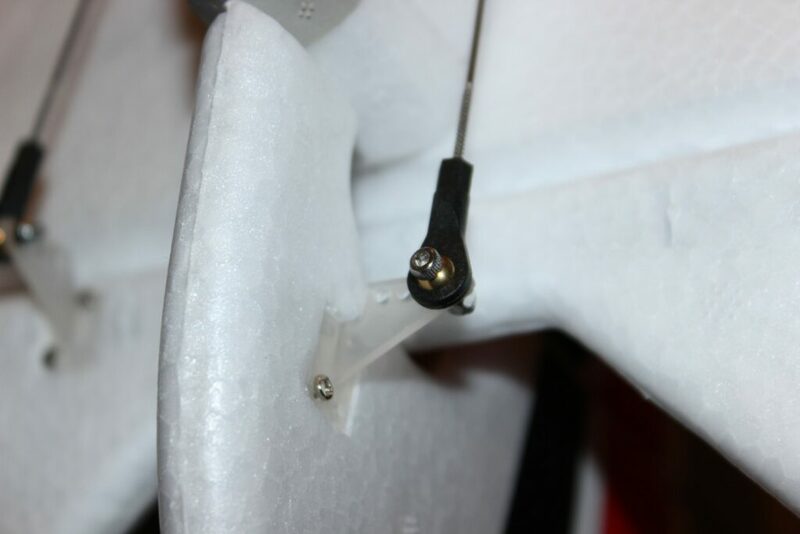 Standard z-bends attach the rods to the servo arms for a slop-free and secure fit. One thing missing is a printed instruction manual, but HobbyKing has an electronic version on the model’s sales page. It may be found here. All was not as perfect as it seemed, however. The elevator servo was internally lunched and a post mortem check showed the culprit to be a broken gear tooth. 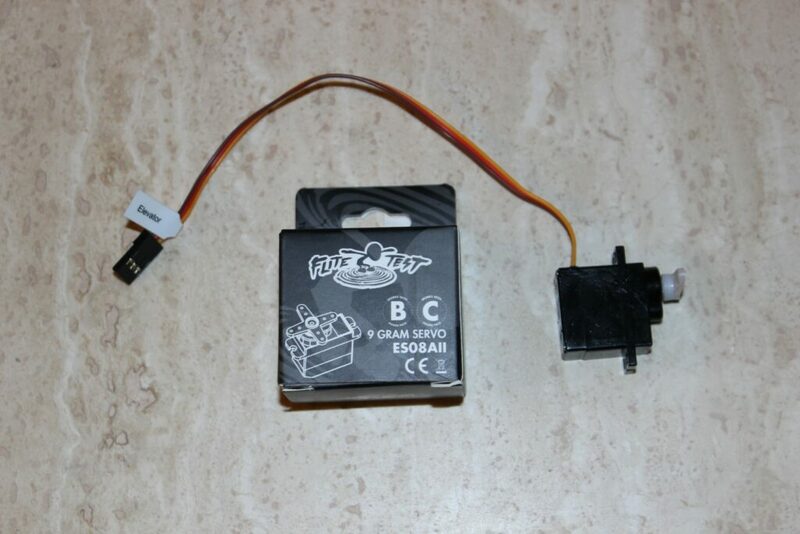 I’ve only had one bad servo in all of the models I’ve reviewed over the years and it’s bound to happen once in awhile. 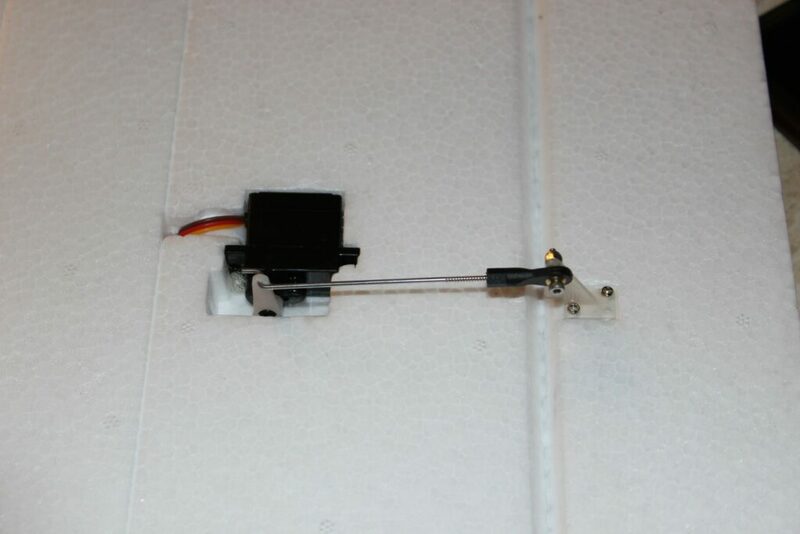 I had a number of good used 9g servos on hand, but I didn’t want to put a used servo in a new model. An inexpensive off-the-shelf FliteTest brand analog servo (along with the label from the original) was pressed into service and it works well. 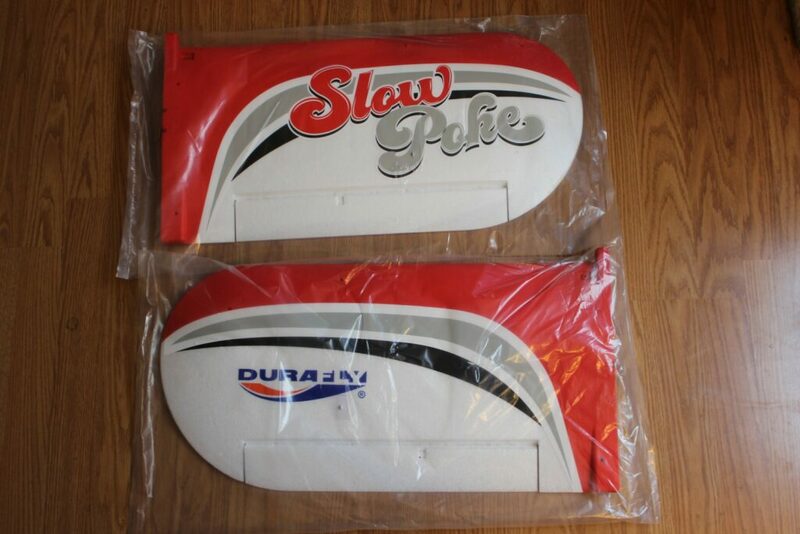 There’s a lot of online buzz about the SlowPoke’s weak servos, but the other three seemed fine and went about their business quickly and quietly. Assembly begins with flexing the control surfaces to loosen them up and then to glue the tail components in place. The glue seems to be up to the builder since all it calls for is “sticky.” I used Bob Smith Industries Foam-Cure. Good thing I didn’t use anything which would have been stronger at the onset since I had to remove the tail almost immediately to tighten a loose 1.5mm grub screw at the tail wheel bellcrank. 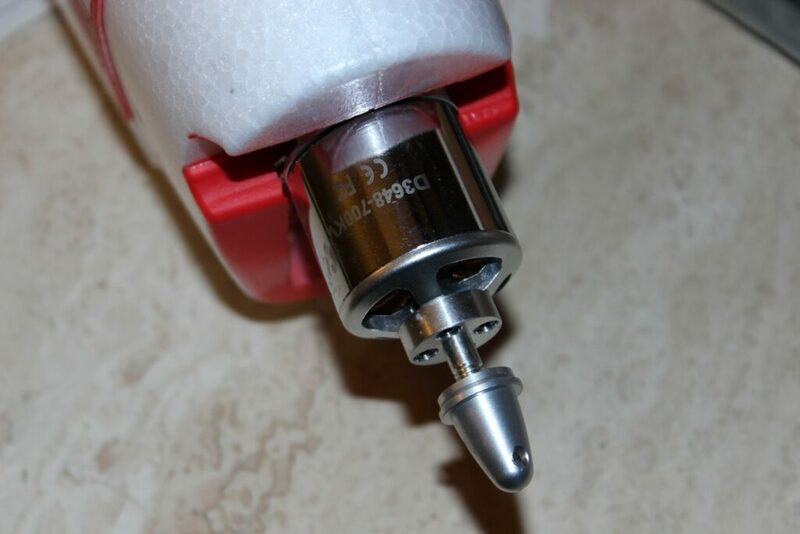 The manual shows the proper method of installation of the ball joint hardware, but the ball joints themselves have to be screwed in or out prior to installation for proper alignment. 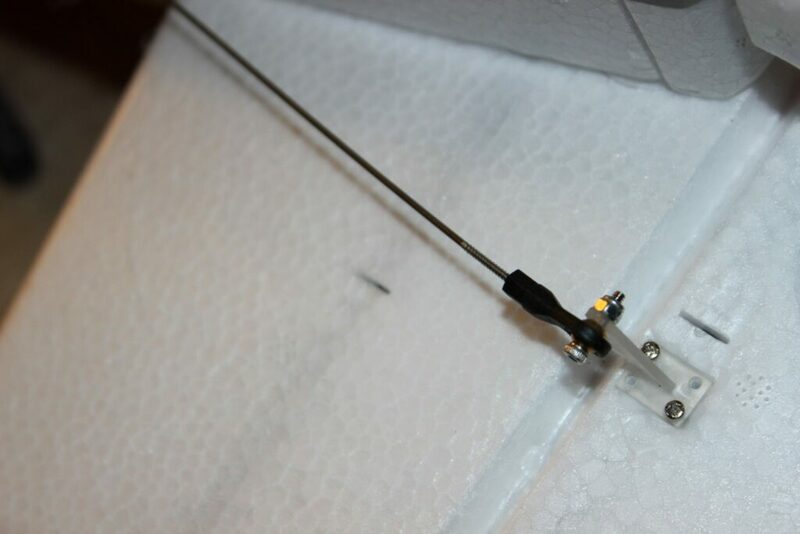 The tail wheel pushrod can be fine-tuned thanks to an ez-connector at the servo. 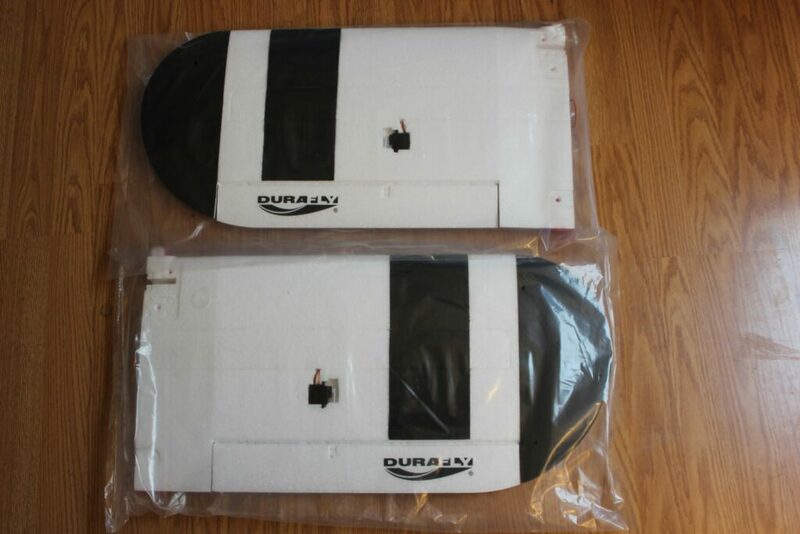 The parts are easily installed with a snug fit and the foam glue held them nicely in place once it was set. Wing assembly is next and the procedure is much the same with the plywood joiner doing most of the work with glue on the inside mating surfaces of the wing. 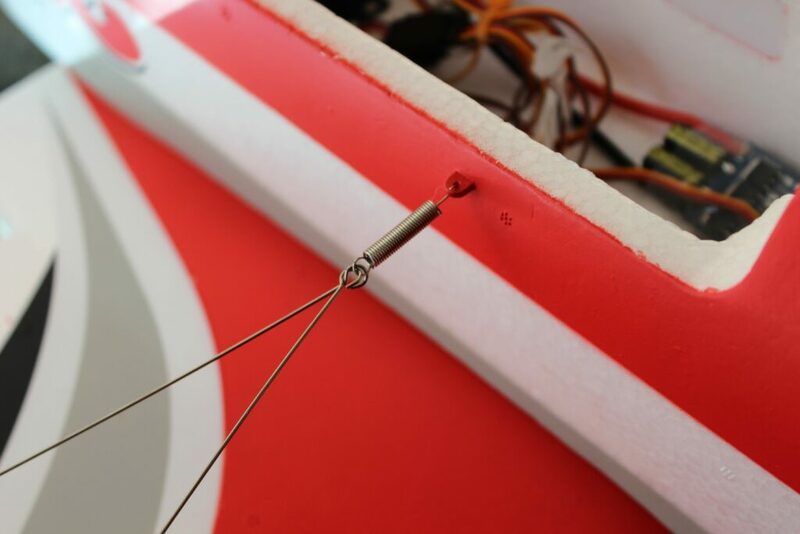 The aileron pushrod installation is described in photos and is done in the same manner as the tail. 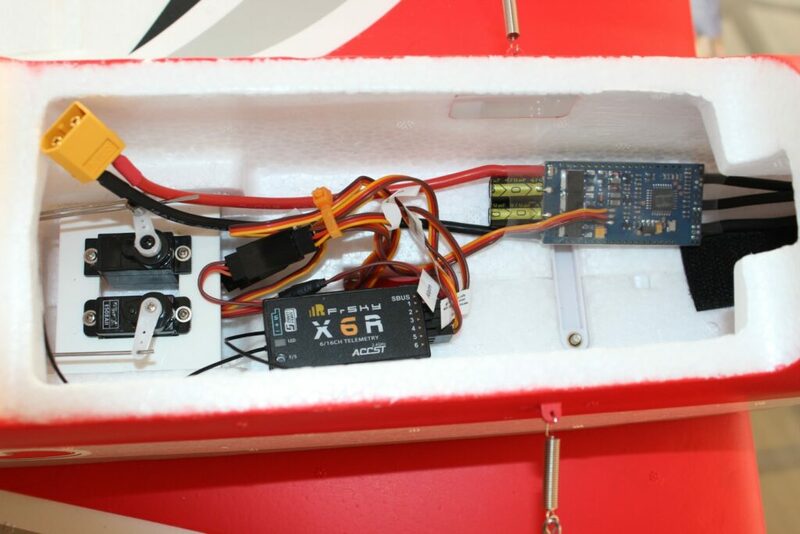 For shipping purposes, the servo arms are tucked up into the wing and should first be lowered by radio or a servo controller. This is something which should have been mentioned in the manual and wasn’t. Neither was the need to add the plastic joiner and undercarriage across the bottom of the wing halves before screwing them into place. It’ll be obvious to any builder, but it’s a strange omission. Six machine screws of varying lengths attach the wing to the fuselage and two small screws hold the landing gear retainer, completing the assembly. A Y-harness for the ailerons is provided…but it isn’t mentioned in the parts list or the instructions. 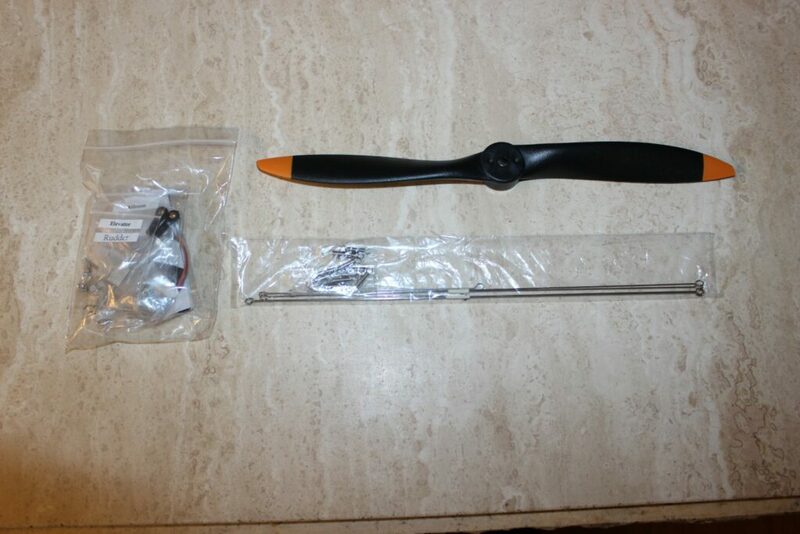 Incredibly, step six calls for the installation of the propeller long before setting up the radio! I thought it best to skip ahead and I recommend that anyone new to electric models do likewise and save the propeller for the very last. 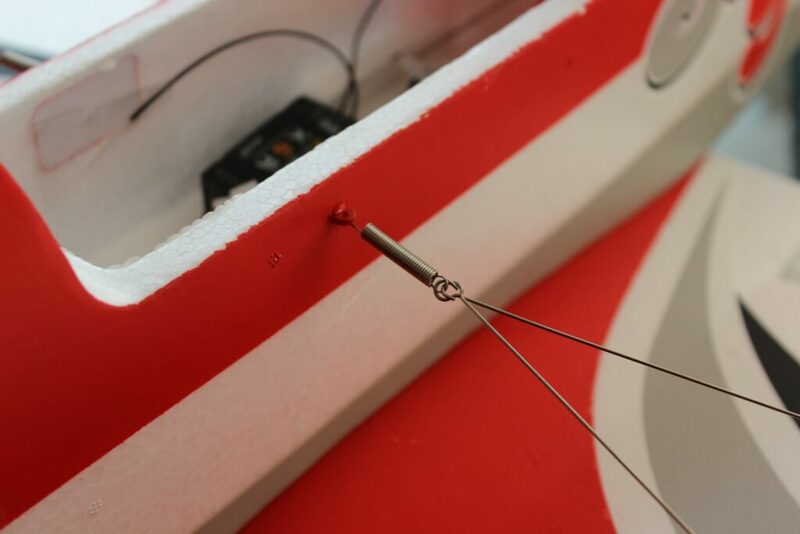 Installation of the metal simulated flying wires and their attaching springs is next and all the manual does here is to show the location. 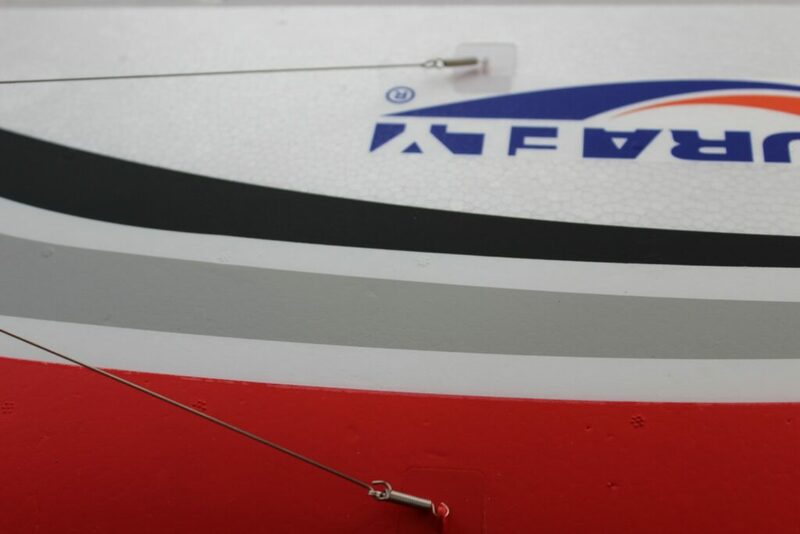 The short rods for the tail are obvious but the ones for the wings are not and the manual makes no differentiation. 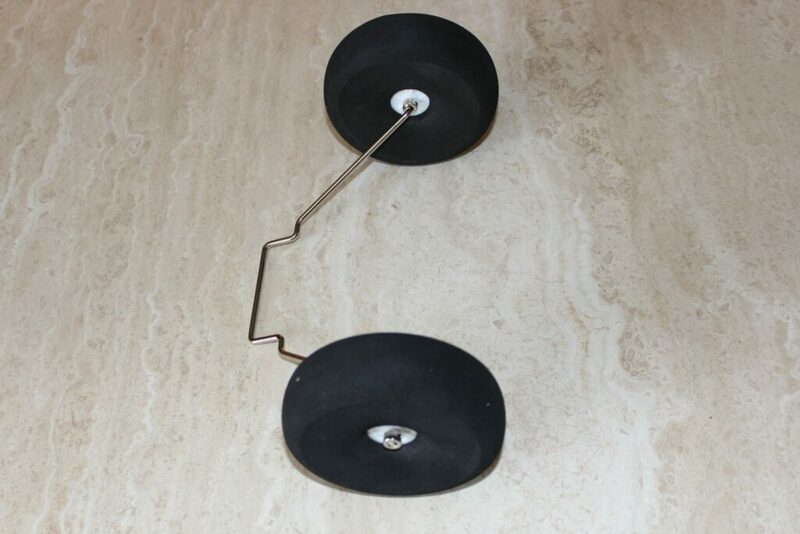 Two slightly larger springs are used at the top attaching point with the shorter of the two long rods going toward the rear of the wing and the longer one at the front. It took a lot of trial and error since the long rods are of two slightly different lengths. These are more decorative than functional and as such, there isn’t much tension on them. Chasing down an errant little spring that was dropped and rolled under a sofa was no fun, but I found it at last. A short piece of carbon fiber tubing serves as a simulated exhaust pipe and it’s glued beneath the model just behind the cowl. The manual recommends “sticky” to hold it in place and the hole is plenty deep and snug to help hold it. That’s all there is to it! It took me longer than normal because of the rigging issue, not to mention photography. When done, the SlowPoke was a sharp looking model, much like a cross between a Spacewalker, a Gee Bee, a Piper Pawnee and (arguably) “The Crimson Haybaler” from the original Wacky Races animated series. Its driver/pilot was Red Max. 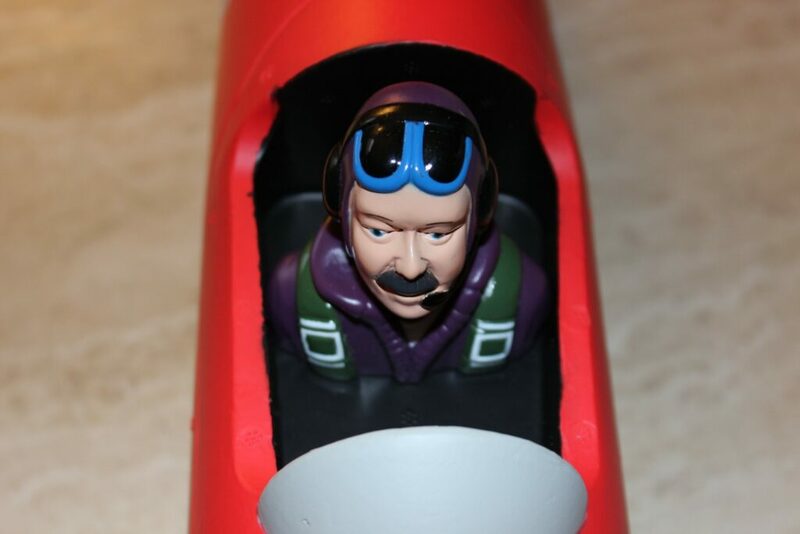 I now have a name for the pilot bust. The difference in RPM was something I could feel while holding back the model, although the stock prop didn’t feel as “doggy” as the internet lead me to believe. With a $4.30 APC, one gets faster prop speed with less draw. Spoiler alert: There’s virtually no difference in the real world. Therefore, all that’s left to do is fly! 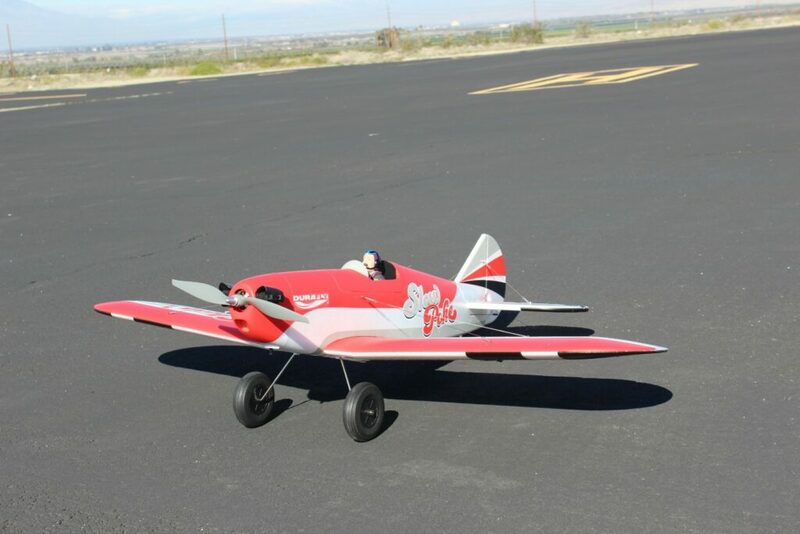 A clear Sunday morning was mine at the Coachella Valley Radio Control Club in Thermal, California when I prepped the SlowPoke for its very first flight. The club has a world class, 865 x 70′ (264 x 21m) paved runway suitable for large turbines, which meant plenty of room for the SlowPoke. Turns out I needed it! 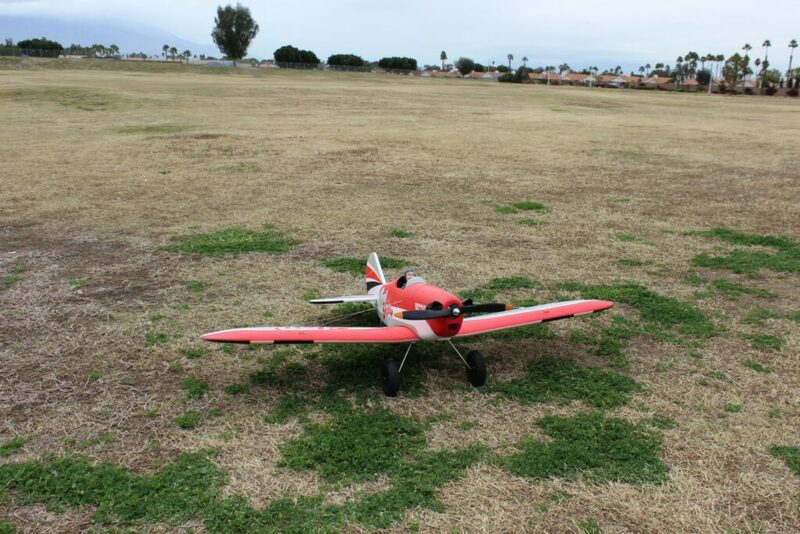 The tall, stiff and narrow undercarriage meant a virtual lack of ground control; it ground looped like crazy. Scale takeoffs weren’t going to happen, so I pointed it into the wind and punched the throttle. That did the trick, although I had to compensate with right rudder due to the P-factor wanting to pull the model left. Once airborne, the SlowPoke really showed its stuff. The only problem I noticed was its tendency to want to dive due to trim. Eventually, I found the trim tab on the Taranis transmitter and I got the SlowPoke flying quite well, although not perfect since it still wanted to dive. CG was later found to be spot on, so it was a simple matter of later adjustments to the mechanical trim. Despite its name, the SlowPoke has some real oomph on three cells despite some internet comments to the contrary. It’s no rocket, but it is certainly no slouch. The 100% control throws with about 25% exponential didn’t make the model twitchy as I feared it might. Instead, control was very smooth in straight and level flight with plenty of throw for a few barrel rolls. I had a suspicion that the undercarriage was going to present problems upon landing and I was right. A shallow gentle touchdown under minimum power sent the model rebounding right back into the air. Twice. I went around to try again and I got much the same result, although this time I flew it down into the runway with no power and a lot more down elevator than one might normally use on landing. That prevented excessive bounce, but it sent me rolling off the edge of the runway. No harm. After swapping the APC prop for the stock prop and changing out the battery, off I went to try and compare the flight characteristics between the two. Wasn’t happening. The tail wheel bellcrank started slipping, the tail was glued in place (albeit with foam glue) preventing access to the bellcrank and I had no tools or glue. I was grounded until I could fix it which was easier said than done. Removing the tail at home and tightening the grub screw at the bellcrank did almost no good; it still slipped. I had to resort to medium CA to resolve the issue which, I’m glad to say, worked. On went the tail and I had to then wait a few days for an opportunity to fly off grass. Since I hadn’t yet flown the SlowPoke in completely stock configuration off of grass with its supplied propeller, I wanted to do both to get a feel for the kind of surface from which these models will likely be flown. There’s a very large grass covered parade ground near me shared by the famous Indian Wells Tennis Garden and Southwest Community Church, on the border of Indian Wells and Palm Desert, California. This field is open to electric flight unless an event is taking place…and no events were taking place when I wrung out the SlowPoke once more. The huge tires and narrow track were right at home on the slightly uneven ground. The SlowPoke tracked perfectly! Takeoff was nearly scale-like, although it still needed a small amount of trim. 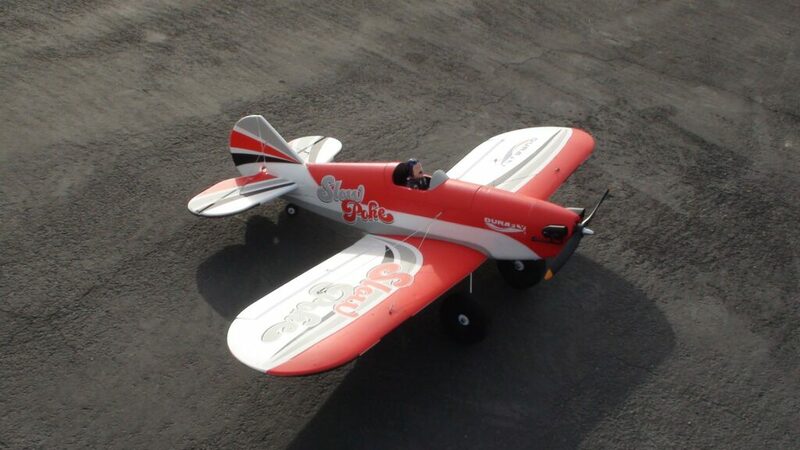 Once trimmed, the SlowPoke was an absolute delight to fly. 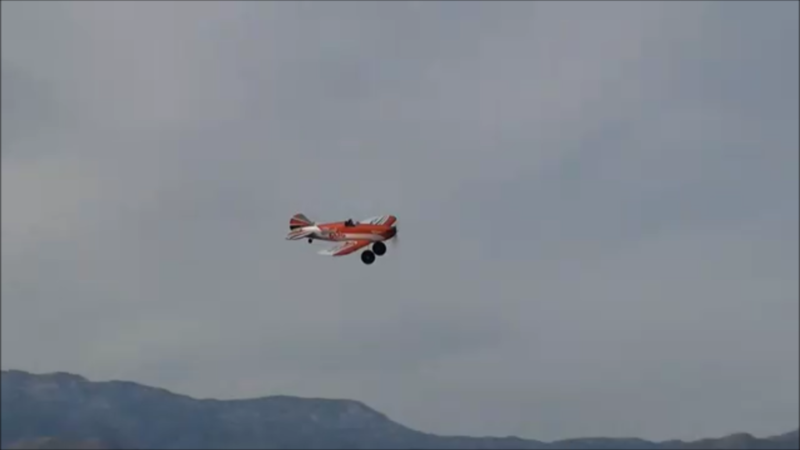 I knew what to expect in terms of performance, so I threw some aerobatics at it. Simply wonderful. Loops and rolls were perfectly straight, meaning I could easily do some Immelmann turns and split-esses. I was even able to stall turn it and perform one heck of a nice lomcevak. Landing was done in a slight crosswind, but I needn’t have worried. Again, I kept just a smidgen of power on approach. There was a very small bounce on touchdown, nothing major. I had so much fun that I pointed the SlowPoke back into the wind and sent it skyward once more. This time, I tried some vertical climbs which it performed surprisingly well! Not unlimited, but not as bad as internet chatter would lead one to believe based on the criticism of the stock prop. It’s perfectly adequate. My next two landings were spot on, although the uneven surface made the ground handling a bit touchy. Fun? Oh yes. Three flights on one brand new battery saw to that. Though not cheap with a retail price of US$18.99, the large foam tundra tires from the E-flite Timber (EFL5258) make a perfect substitute if drilled out with an 11/64 drill and secured on either side of the hub with 3/16″ wheel retainers. Four are necessary for this mod since the wheel is narrower than stock. A test back at the club showed the mod to be a good one. It was still a little squirrely with that P-factor still wanting to pull it to the left, but nowhere near as badly. The real difference was in the landing! 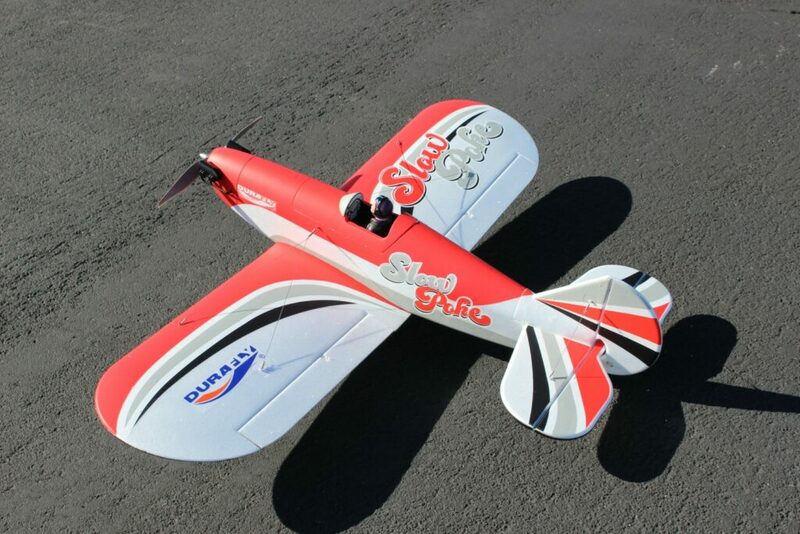 The SlowPoke likes to have a little bit of power on approach and a smooth landing virtually free of bouncing was now possible. The secret to smooth takeoffs was very gentle throttle to get it rolling straight followed by gradually more aggressive throttle coupled with some right rudder. I may see about creating a mix for that very thing in the Taranis. 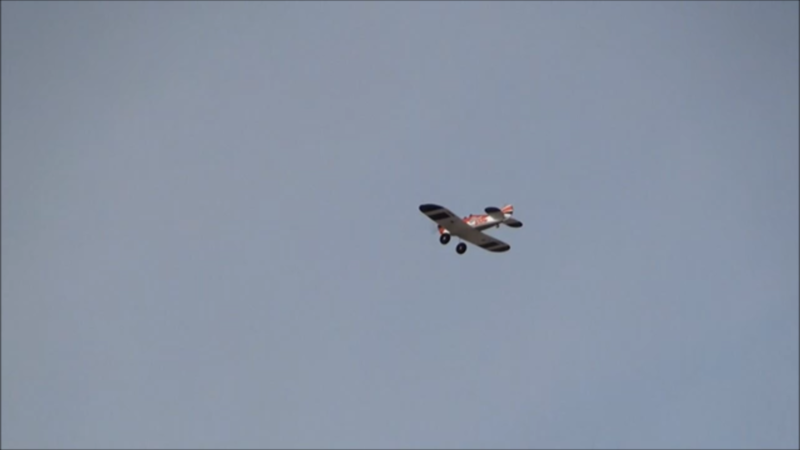 Thanks to club videographer George Muir, the video below gives a really good idea of what to expect from this mod when powered with the stock propeller. Best of all, I had that little model dialed in right. I called out some of the aerobatics for George’s benefit, all the while having about as much fun as one can have with a model plane. Only one problem and I pointed it out to Rebecca Bestawros back at HobbyKing. I wanted to compare props…and managed to break the hollow aluminum prop adapter with threads for a spinner when snugging up the stock prop! There were more than enough threads left to securely attach the APC prop with its thinner hub, but readers should be forewarned that too much tightening might mean a broken adapter. The good news is, it’s available as an inexpensive service part and can be ordered here. With Toby Arnold at the helm and Rebecca Bestawros in charge of product development, a new day has dawned at HobbyKing. Shipping and returns are being streamlined and each suggestion I’ve made about this model is being shared with the engineers. 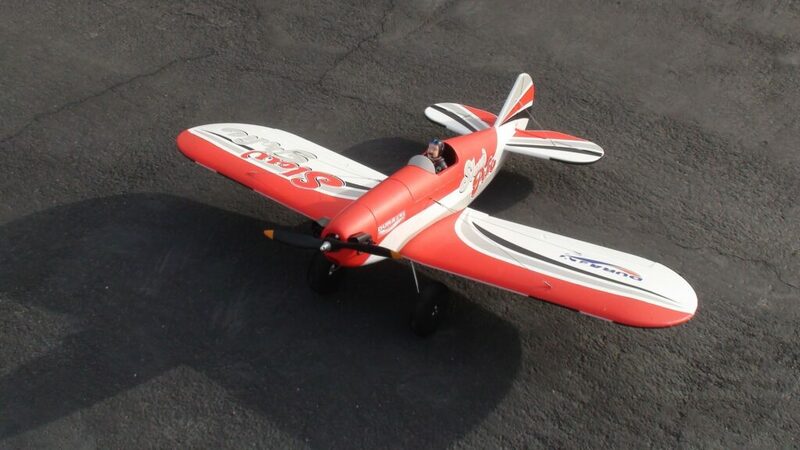 The issues are nothing which a good modeler can’t address and once in the air, the Durafly SlowPoke 1200mm plug-n-fly Red Edition is the standard by which I believe all future Durafly planes will be judged. There are no bad habits whatsoever, it isn’t nearly as slow as the name would lead you to believe and the internet is abuzz with easy upgrading to four-cell power. Regardless of whether one chooses the original blue version or this stunning new red version, the SlowPoke deserves a full two thumbs way up. This model will be accompanying me on lots of future flights. Many, many thanks are due to Toby Arnold, HobbyKing’s peerless new CEO. Based on my past dealings with him, this company is in the best possible hands. Rebecca Bestawros in the HobbyKing marketing department in Australia took time out from a major summer heatwave in the Southern Hemisphere to arrange this great new version to be sent to me via the Oregon warehouse. George Muir of the Coachella Valley Radio Control Club has been my go-to guy for years and he never disappoints with his steady hand on the camcorder. Nathan Maat is the editor-in-chief here at RC Universe on behalf of you, our worldwide audience. Get a new red SlowPoke and see what all the great buzz is about! Here’s a look at the new red version in action!